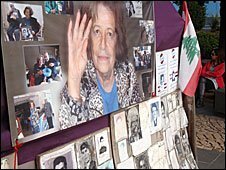 The people who went missing during Lebanon’s civil war in the 1970s and 80s are in danger of being forgotten as their parents and siblings grow older. One mother I knew died without ever discovering what happened to her children. Audette Salem was just one woman whose loved ones disappeared in Lebanon’s civil war. Some 17,000 people vanished during the bloody conflict, most – it is thought – abducted and killed by militias. But some believe a few hundred may still be alive in Syrian jails. I first met Audette in a tent outside the United Nations headquarters in Beirut. She, along with other families of the missing, had set up home there to demand an investigation into their disappearance. A 77-year-old woman with a small frame and a resigned look on her face, Audette quietly told me about the day her son and daughter disappeared. It was 1985, and 19-year-old Marie-Christine and 22-year-old Richard were driving home for lunch with their elderly uncle George. Somewhere along the way they were kidnapped. At home, Audette waited for them to arrive – for hours – anxiously looking out of the window for signs of their orange Volkswagen. When it dawned on her what might have happened, she went to the militia leaders, risking her own life to glean what information she could. Invariably, Audette told me, the men would tell her they didn’t know anything. She never saw or heard from her family again. Five years later, when the war ended, Audette again visited the militia leaders, who had, by then, become government officials. She said they cold-heartedly told her to stop looking and move on. With the passing of time, the chances that Richard, Marie-Christine and George were still alive diminished. Yet Audette refused to give up hope – it was all she had left. She would tidy her children’s bedrooms as though they might reappear that very evening. She rearranged Richard’s guitars, cigarettes and razors, and dusted Marie-Christine’s bed and make-up. Audette was interviewed three times by a commission established by the government to look into the disappearances. But she felt the commission let her down – it never published its findings and did little, she claimed, to investigate the hundreds of mass graves dotted around the country. Shortly after the war ended, the Lebanese government passed an amnesty law protecting militia members from being prosecuted for war crimes. It also effectively snuffed out any hopes of a real debate about the bloodshed. Indeed, it seems the war amnesia is no accident. Since I first came to Lebanon 10 years ago, I’ve seen traces of the conflict almost completely wiped away. Back then, I was stunned by all the bullet-riddled buildings. Now, I’m shocked by how few of those buildings are left to remind people of the war. It is almost as if it never happened. There are no official war memorials or commemoration dates, and up until a few years ago, the site of an infamous massacre in the Sabra and Shatila Palestinian refugee camps was a rubbish dump. Because of the reluctance to stir up memories of the war, little has been done by the government to investigate the whereabouts of the missing. Prime Minister Saad Hariri has said he will bring up the issue of the disappeared in talks with the Syrians, whose military were present in Lebanon soon after the start of the civil war and until just five years ago. But many are sceptical anything significant will come out of it. As some of my Lebanese friends tell me, the war may be over on paper, but in people’s minds it rages silently on. 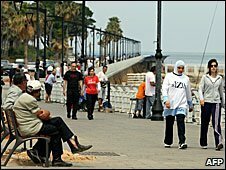 Sectarian tensions, mostly between rival Christian and Muslim groups, are still very much a part of Lebanon’s social fabric. Without a proper discussion of why the war happened and what occurred during the conflict, many believe Lebanon’s troubles will never truly go away. For people like Audette, any truth which is uncovered about the war will have come too late. She lived in her protest tent for 1,495 days, giving up the comforts of a real home to brave hot summers and blustery winters in the company of others who had lost relatives. But last May she was killed by a speeding car as she crossed the road near her tent. At her funeral, held at the tent, more than 100 friends gathered to pay their last respects. They also came to deliver a message to the government: Audette spent the last 25 years searching for news of her children and died no closer to finding it. This spring, those friends are no doubt hoping Audette’s prayers will one day be answered. As the 33rd Anniversary of the Start of the Lebanese Civil War passes, many, although not the government, are still asking: where are the ‘disappeared’? April 13, the anniversary of the outbreak of the devastating Lebanese 1975-1990 civil war, came and went quietly and perhaps even unnoticed for many in the capital city Beirut. For many families, however, the anniversary was a painful reminder that the war and all of its consequences still haven’t been properly addressed. Even on the symbolic level, there is no official day to commemorate the war, nor any monument or memorial to honor the dead. Around 100,000 people were killed in the 15 years of fighting and it is thought that up to 17,000 individuals ‘disappeared’. Many of those were arrested, kidnapped or killed by the Israeli and Syrian armies or by the Palestinian and various sectarian Lebanese militias that were involved in the fighting. Hundreds are thought to still be in Syrian and Israeli prisons. After the 1989 Taif Accord ended the civil war, the government was keen to leave issue of the war behind, and declared an amnesty law for all crimes perpetrated before March 1991. As a result, the fate of most of those who ‘disappeared’ remains largely unaccounted for and ignored to this day. In the face of governmental inaction, it has been left up to civil society in Lebanon to mobilize. There was a surge in activity in the weeks leading up to the April 13 anniversary. Offre Joie, the Lebanese Association for Human Rights and other local NGOs organized a peace march through Beirut that day. On April 10, the NGO Support of the Lebanese in Detention and Exile (SOLIDE) held a press conference outside the United Nations Economic and Social Commission for Western Asia (ESCWA) building in downtown Beirut, where several families have been holding a sit-in protest for the last three years to demand an investigation into the fate of their loved ones. Speaking to the assembled press, SOLIDE Director Ghazi Aad lamented the failure of the Lebanese government to investigate the ‘disappeared’, saying, “Lebanon is party to this crime in its refusal to take the issue seriously.” Another Lebanese NGO, UMAM- Documentation and Research (UMAM-D&R) organized a talk entitled “What is to be done? 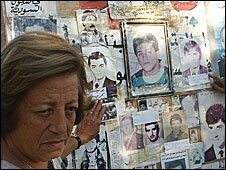 Lebanon’s War-loaded Memory”, together with an exhibition of photographs of hundreds of the disappeared, “MISSING”. At the talk was Dr. Alex Boraine, deputy chair of South Africa’s Truth and Reconciliation Commission and chair of the International Center for Transitional Justice, who stressed that an open and honest assessment of war crimes could help to heal traumatized societies, citing South Africa’s experience as an example. Just days after the anniversary, Lebanese authorities examined what was thought might be a mass grave on the Halat highway, near Byblos in northern Lebanon. Although nothing was found, the investigation testifies to the fact that Lebanon still has a long way to go in addressing its war memories, on both a symbolic and practical level. Further evidence attesting to that fact is the vicious criticism that Michel Aoun, head of the opposition Free Patriotic Movement, received from other MPs after alleging that a mass grave was located at the Halat site. AS SAFIR reported Amin Gemayel, head of the Phalange Party, as accusing Michel Aoun of “digging up the past,” whilst AN NAHAR reported Christian Lebanese Forces leader Samir Geagea as criticizing Aoun for “lying”. The current political climate is not helping advance the demands of the families for an investigation into the disappeared, either. Lebanon has been in political deadlock for the last few years- parliament has not convened for the last sixteen months and no President has been elected to replace Emile Lahoud, who ended his tenure in November 2007. A bitter battle between the parliamentary majority and the opposition over the formation of the new government is to blame. The tents of the families camped outside ESCWA are almost invisible amongst those of the opposition, which have brought the area to a complete standstill. In a related development, the Christian Phalange Party and the Palestinian Liberation Organization (PLO) on April 15 held a conference aimed at reconciling the two parties that were vicious enemies during the war. According to the official Phalange website (www.kataeb.org), Phalange chief Amin Gemayel stated at the conference that “we should – rather than remembering the battles and heroism that occurred between us and the Palestinians – recall the relationship between Lebanon and Palestine before the Naqba [Israeli victory of 1948, resulting in the “Catastrophe” of around 800,000 Palestinians being made refugees] … the social, cultural, and spiritual proximity between our two peoples that made Palestine, of all Arab states, closest to Lebanon.” The conference follows an apology to the Palestinians by 44 Christian figures who participated in the war, which was itself preceded by an apology in January on behalf of the Palestinians to the Christians by PLO representative in Lebanon Zaki Abbas. Although certainly positive steps towards reconciliation, it is to be seen whether these developments will lead to any admissions by either side over the fate of missing persons, or an investigation into their whereabouts. With no end in sight to the political stasis strangling Lebanon, the families of the ‘disappeared’ look set to face more years of inaction. But, as the activities of SOLIDE, UMAM-D&R and other NGOs testify, those families do not appear willing to remain silent about their missing loved ones, even if their politicians do.